PPE (personal protective equipment) requirements assessment documents describe fulfillment of required safety in workplaces. PPE – personal protective equipment requirements are raised as per regular working process, machinery and equipment used in the manufacturing or supporting process, chemicals or any material that used in the manufacturing processes that needs to proper safety of each employee working in the processes and workplaces where heavy equipment and machinery used to moving materials, handle materials or materials used as raw materials are heavy that needs to proper safety and awareness of safety, personal proactive equipment wearing and awareness of used to each employee are important to maintain safety in working environment. Personal protective equipment requirements are depends on the works that assigned by management of process requirements that department personnel are managed and conducted the tasks, and those tasks possible risky that needs to proper care during the completion of tasks are needs to manage each heavy equipment, machinery and materials, chemicals that can be hazardous for the humans or environment that needs to manage each requirements, for the humans needs to wear personal protective equipment and same the aware for the used ppe is required equally. PPE requirements assessment documents are used to recording information of the personal protective equipment requirements to analysis of each process, listing each process and movement, materials, chemicals and other equipment and machinery used in process are verified to identify and organize each requirements of personal protective equipment, deployment of work instructions and procedures, guidelines for safety point of view that help to determine risk levels and minimization of each risk level in the manufacturing and supporting process. PPE – personal protective equipment assessment documents are describe information of requirements and its assessment are managed according to analysis of each process conducted in the manufacturing and supporting processes, and accordingly assessment process is managed, in the assessment two major requirements one is provide personal protective equipment as per process handled by employee and second is provide detailed training to employee concern its works and personal protective equipment used during working hours in workplaces and its assessment measuring, effectiveness of training, verification and inspection of personal protective equipment physically as well as visiting and monitoring that each employee is use protective equipment during working hours are important part of assessment and on base of the assessment, safety in workplace is maintained. 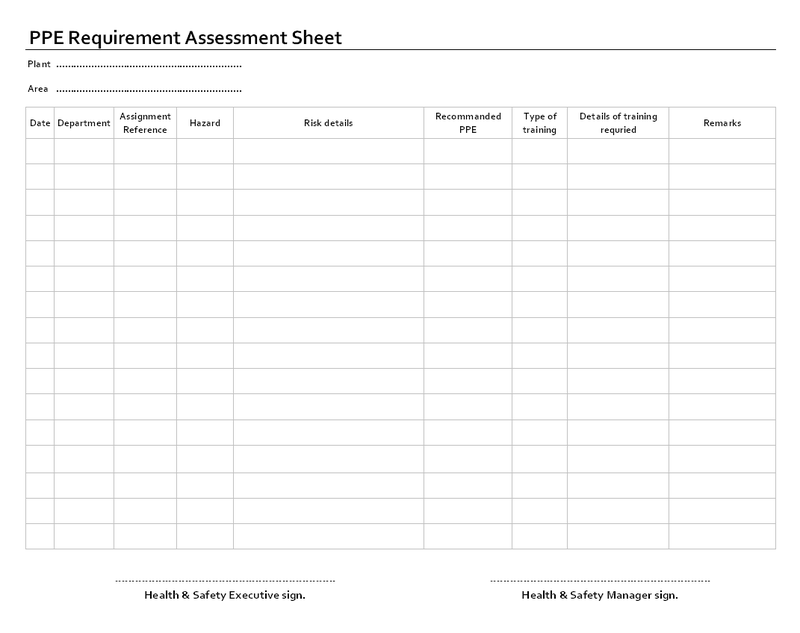 PPE requirement assessment sheet format is used to recording information of personal protective equipment requirements in manufacturing and supporting processes that used heavy equipment, machinery, processes that are considered as hazardous, materials and chemicals that used in processes are considered as hazards that needs to care during operating and handling, that needs to proper equipment to maintain safety in workplaces, that concern management is identify requirements of personal protective equipment to maintain safety of each employee working in workplaces, and also for the minimize risk level during working hours.